How can Freelancers Help Malaysian Business Owners? How can Freelancers Help Malaysian Business Owners? - As entrepreneurs, what qualities defined your success? It can be quite comprehensive to say it is a mixture of a bold idea and adventure, a clear sense of direction for the future market, hard work, determination, persistence and self-discipline. Why do people still want to venture into businesses when it’s such hard work? Read 50 Reasons to Start Your Own Business. Being on the realistic side of it, businesses do not always thrive and prosper overnight. Three students from Helsinki University of Technology, namely Niklas Hed, Jarno Väkeväinen and Kim Dikert, started a company and made 51 games until the verge of bankruptcy and they finally decided to try and make one more game which became the phenomenal ‘Angry Birds’ in 2009. The Kentucky Fried Chicken (KFC) franchise would not be where it is today all over the world if it wasn’t for the resilience of Colonel Sanders’ facing 1009 times of rejections. Businesses operation has undergone massive modernisation apart from the basic qualities entrepreneurs should have. Enterprises today pay much attention to advertising and marketing on social media platforms. Social media, being a key factor to businesses, are essential in boosting sales and profits. In addition, some major positions such as financial consultants are increasingly being replaced with freelance positions instead of full-time employees. To adapt with the current situation, more and more enterprises are looking forward to building a team inclusive of permanent employees and freelancers. The gig economy is no longer a ‘fresh’ thing amongst Malaysians as freelancing has grown by 31%. For business owners, would you hire freelancers to help build your businesses? I’m sure we have all heard about freelancers diving into different sectors of the economy. If you haven’t, here are the Top 5 Freelance Jobs in Malaysia. 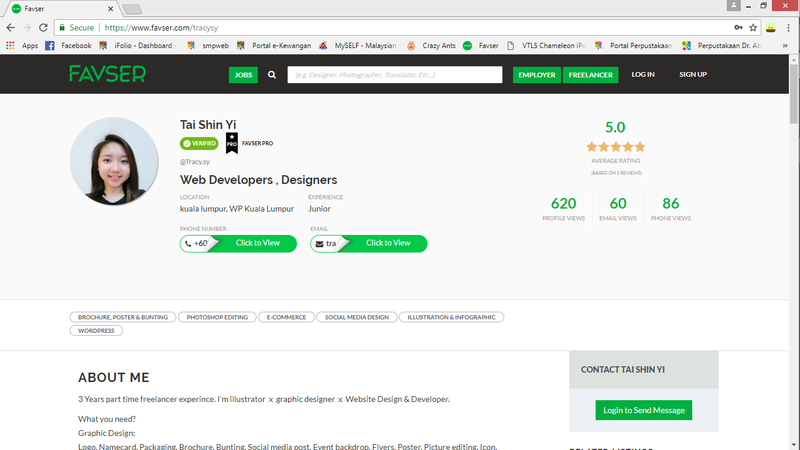 Though there are many other freelance platforms such as Freelancer, UpWork and Fiverr; Favser is the leading freelance platform in Malaysia. 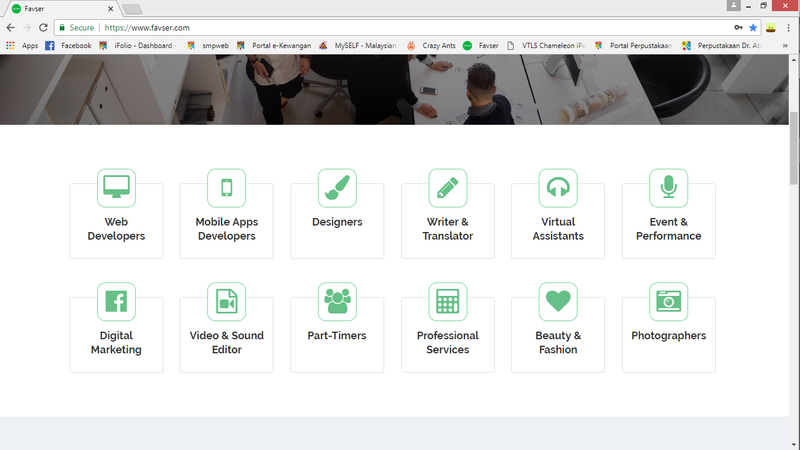 Browse through 12 large categories in Favser for freelancers offering their professional services to suit your company’s needs. 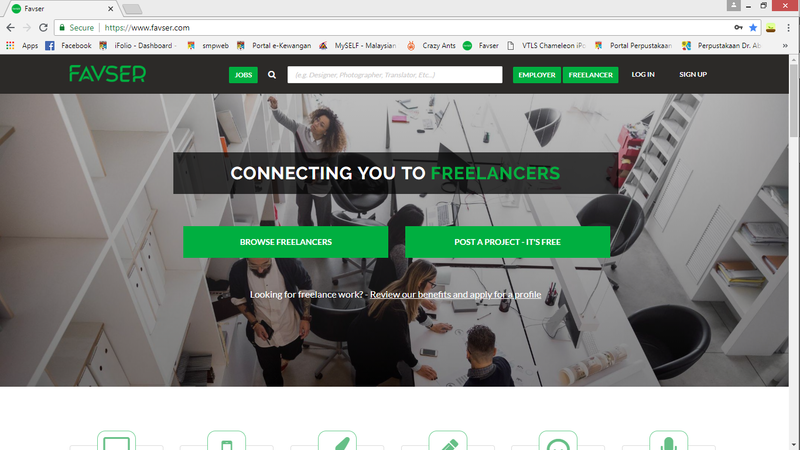 Let’s take a look at some of the professional services offered by Favser freelancers that are much needed and at times vital to businesses. Redirecting back to how enterprises today focus largely on advertising and marketing strategies, SMEs and large corporations require copywriters, content writers and translators to help craft interesting and relevant content for their advertisements, webpages and even social media posts. Recalling back on the essential skills of a successful writer, these freelancers are experts with words manipulation. Language is crazy, beautiful and powerful at the same time. If business owners could harness the expertise of writers and translators, a great article crafted is like the core of advertising. Words transcend by catching viewers’ thoughts and reading makes them think and feel intrigue with the products offered. Modernisation + technology = digitalisation. The human race is innovative. Advertising has evolved from word of mouth to newspapers, to pamphlets, to radio broadcasts, to television, and now to photos and short clips. It has also evolved from monochrome to fully coloured screens. If you’d look and delve deeper into the freelancing community, a large chunk of designers and photographers are moving towards freelancing then entrepreneurship. To make sure business advertisements are eye-catching and spectacular, business owners require the help of designers and photographers. A great photo with the proper graphic designs makes the advertisement ‘pop’ out and leaves a lasting impression on consumers. Who would have thought shopping could be so easy these days? I’m positively sure 3-4 decades ago, nobody would have thought businesses can be done on our fingertips, let alone shopping without touching and looking at the real product. The major breakthrough was the World Wide Web or so we call the internet. With the internet connecting people from all over the world, entrepreneurs can take the advantage of marketing products through it. Web developers work to customised a webpage dedicated to the company itself and the designing of the interface coupled with interactions can be made according to business owners’ preferences. If you’re not into building a whole new webpage from scratch, social media marketing is also a very influential platform to conduct businesses. Facebook and Instagram offer platforms to buy and to sell and one can reach the business owners directly through personal messages (PM). Why do people offer professional services as market research consultants? Though it may seem as if market research does not play much of a role, but market research plays a vital yet fundamental role in helping business owners understand their consumers. As the saying goes, ‘The customer is always right’. To be able to fully understand customers’ needs is like a ‘boarding pass’ to board on the expressway to the heart of consumers. Market research also enables enterprises to focus on certain products that can gain more profit and also find ways to further improve the business. From large corporations to small enterprises, every form of business would some record and tracking of finances. As acquired by the law, everyone would need to pay taxes to the government. In these situations, business owners could opt for permanent accounts and taxation consultants or acquired the services of freelancers in these fields. The pros of freelancers as such are one can obtain professional services and one can save the long-term costs of stable payrolls. Accounts consultants can aid in managing the finances of a business while the taxation consultants can ensure that the company abides by the law of taxes. If you’re in need of legal advice, it’s always best to inquire of the services of a legal consultant. Legal consultants are responsible to provide legal advice, assist in handling disputes, analyse and identify the legal issues, draft the legal documents, maintain correspondence, etc., so that the organization earns maximum profits and that there are no legal actions taken against the organization. Legal consultants also protect the company from any legal disputes. How can Favser Freelancers BOOST your business? What’s so good about freelancers? It would be needless to say that freelancers will offer the best professional services available to business owners. On Favser’s platform, there are about more than 4000 freelancers (as of 30 June 2018) and one is bound to find an expert out of the large pool of professionals. From copywriters to designers, from market research consultants to legal consultants, get the right expert for your jobs’ needs! To know more on why you should hire Favser freelancers, read on ‘What’s in it for employers’ on Freelancers: The Future Workforce of Malaysia. Market your businesses through social media platforms. One could never underestimate the power of social media. Remember how products like the famous Korean brand ‘Klavuu Pearlsation Bare Face Cream’? If products can go ‘viral’, so could services and just about anything else. Getting social media marketing and management freelancers can help you to target consumers with the right amount of words, pictures and motion to capture people’s attention and boost your business. Getting freelancers in these fields also help business owners with all the cluttering work from inquiries to orders to advertisements. Finance is a crucial part of all enterprises. Without the ease of cash flow, day-to-day businesses could be a challenge. Hiring accounts consultants can help the company to keep track of any financial changes and what can be done to improve the enterprise and enhance its growth. Experts in the field also help business owners to develop, implement and maintain financial control procedures. Accounting consultants offer specialized advice relevant to clients’ businesses in addition to managing figures. If needed, they can also develop accounting systems cater to your business’ needs. Having your finances managed, be at ease that your business is bound to soar! As mentioned in the few paragraphs above, market research is like a building block in entrepreneurships. To be able to constantly update yourself on customers’ needs is essential to bring your business to greater heights. As quoted by John Russel, “The more you engage with customers the clearer things become and the easier it is to determine what you should be doing”. Business is not just making a sale, but it is more of a priority to make customers. If business owners can secure the hearts of customers, then there’s no doubt they will return to make a sale with you the next time! One of the simplest yet direct ways to boost a business is to cut off all unnecessary costs. While there is always a need for a number full-time employees in a business, some roles can be replaced with professional freelancers doing the job. It wouldn’t make any sense to hire a full-time web developer for a microenterprise whereas employers can just obtain the expertise of a freelancer be it on a one-time project or even on contracts. Freelancers can offer attractive rates for their jobs and business owners can have a peace of mind with the professional services granted. HIRE YOUR FREELANCERS FROM FAVSER TODAY! STEP 1: Log on to the Favser website. You can type in the search box for the professionals required (e.g. designers). OR register as an employer and post a project. 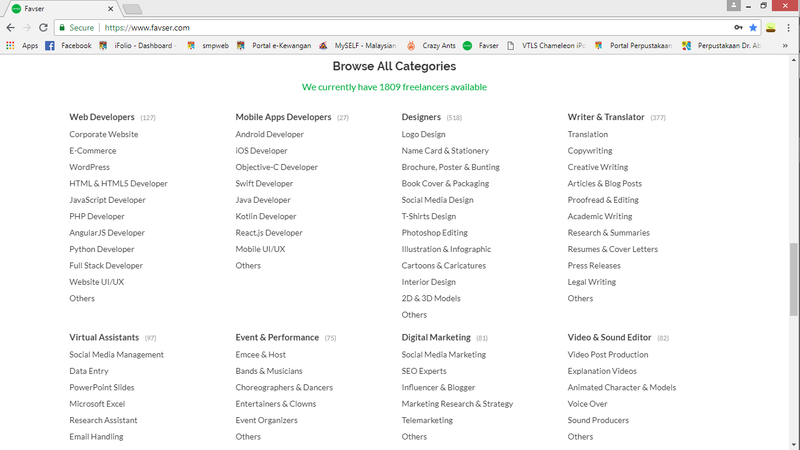 STEP 2: Browse for freelancers via categories as you scroll down. STEP 3: Browse for different sub-categories to be more specific. STEP 4: Contact a freelancer! As freelancing becomes an increasingly popular career option, businesses should adjust their hiring preferences accordingly and take advantage of the wide range of services available on online freelance platforms. It will be interesting to witness the revolution of the future workforce with technology advancements in years to come. Click here to hire a professional Malaysian freelancers to help to start and grow your business at an affordable rate!